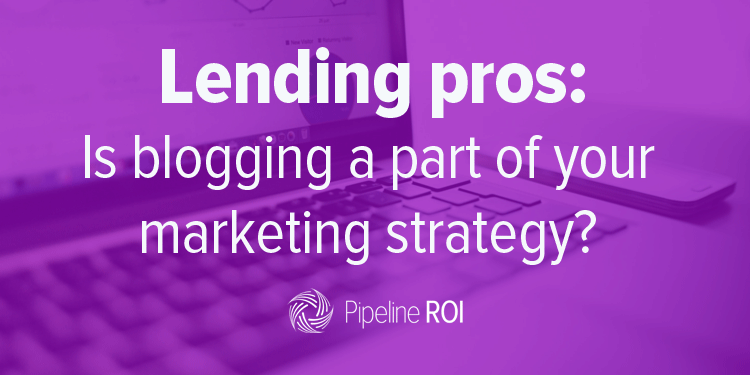 Lending pros: Is blogging a part of your marketing strategy? We hear you— blogging is difficult! It might leave you wondering if it’s worth the investment, or if it will even benefit your business at all. 82% of companies who blog daily acquired a customer using their blog, as opposed to 57% of companies who only blog monthly. 90% of consumers find custom content useful. 78% of consumers believe that companies behind content are interested in building good relationships. 81% of U.S. online consumers trust info and advice from blogs. 60% of consumers feel more positive about a company after reading custom content on it’s site. Potential borrowers come to you everyday seeking advice. You’re the in-person expert for them. With blogging, you can also be the expert online. So much research for the home buying process is now done online. What if you could be found with answers to their questions: How are mortgage rates determined? What is the difference between a 15-year fixed rate vs. a 30 year fixed rate mortgage, What are the different loan programs? Can bi-weekly payments really pay-off my mortgage faster? What can I expect on closing day? Someone is going to be present online, with answers to these questions. Why not you? By providing this information to potential clients, you build trust with them while assisting them through the lending process. Beyond lending advice and information, you can also publish local content to your mortgage blog. At first it might not make sense to blog about things like local events and great places to eat in your community when your goal is to attract clients to apply for a loan. But there’s no better way to build your reputation within the local community, while boosting your local SEO! Demonstrates you’re an involved and informed member of the community — a local expert who knows what works best for their market. Helps people see your community involvement (especially millennial buyers). Positions you as an expert in the community—a trusted, go-to source for new buyers. Sends hyper-local signals to search engines that you are an expert in the local area so they return your site higher if someone in the area is searching. By demonstrating involvement and knowledge of your local area, search engines pick up on the fact that you are actually part of the community you have listed on your site. Remember, you are doing this extra effort to serve your local community, position yourself as a local expert, and to be found by the search engines. With today’s consumer habits, it’s not longer a question of if you should be blogging, it’s what you’re going to write about. And we’ve got you covered.